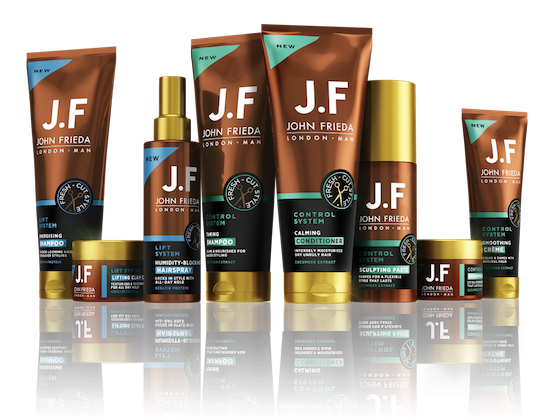 JF Man has been created by the experts behind one the biggest and instantly recognisable hair brands, John Frieda. Drawing on three decades of experience in transforming hair, JF Man is a dedicated men’s collection - their first - of care and styling products that work together to tackle some of modern men’s most challenging hair concerns. “Our research revealed a clear demand for dedicated men’s hair care and styling products, with Mintel forecasting +11% growth in the Men’s haircare category through to 2020. The result is two ground-breaking collections that are designed to combat the frustrating natural tendencies hair has as it grows, helping men manage their hair between barber visits, getting them closer to that fresh-cut feeling, every day,” says Karolina Tlalka, Marketing Manager, JF Man. TheChicGeek says, “This range is split into two: LIFT for thin, flat hair that needs lift and support; and CONTROL for unruly, dry or thick hair. I’m firmly in the ‘LIFT’ category - the blue accented products - and I already like the way there isn’t a conditioner option. It makes me feel like they know what they’re doing, instead of that annoying thing of a ‘shampoo/conditioner’, because men are ‘lazy’, when, if you have fine hair, you don’t want a conditioner making it lank and greasy. Within the LIFT option there is a shampoo, clay crème and hairspray. It all feels really light, which is what you want with thin and flat hair. The shampoo has a great texture and contains Keratin Protein and Vitamin B5. The ‘Humidity Blocking Hairspray’ is a non-sticky spray that is truly non sticky and has hold without it feeling too rigid. The ‘Lifting Clay Crème’ is light and doesn’t feel like it’s weighing down your hair. Since 1980, Dermatologic Cosmetic Laboratories’ (DCL) scientists have closely collaborated with physicians to create targeted and innovative skincare formulations for some of the best, brightest and most venerated names in skincare, including renowned dermatologists, global top-selling brands and influential retailers. A couple of years ago they launched their own skincare range. The DCL Active Mattifying Range targets both genders but with a primary focus on men. The active mattifying range is targeted to oily skin, to help clear excess oil and sebum from the skin and eventually minimise the appearance of pores over time. Dermatologist tested. Non-comedogenic, hypoallergenic. Paraben-free. TheChicGeek says, “I hadn’t heard of DCL before. This American firm has some serious pedigree and certainly has the experience. Like most manufacturers who produce for others, the clever thing is to start your own brand and use your expertise exclusively for yourself. This has been happening in fashion and now it’s time for beauty/grooming. I tried the moisturiser which had a broad spectrum UVA/UVB protection of 30. It says it rehydrates oily, combination and acne-prone skin without blocking pores or provoking flare ups. 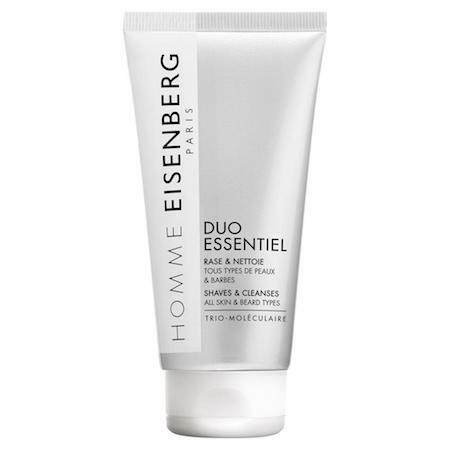 This is really light and is definitely mattifying, so great for men's oilier skin. I like the feel and it has no weight, considering the high SPF. It is pushing it in price in the pricier range of moisturisers, but you’re not paying for the brand, you’re paying for the science." Founded by an Italian living in Monaco, Eisenberg Paris, is exclusively available from Urban Retreat in Harrods. 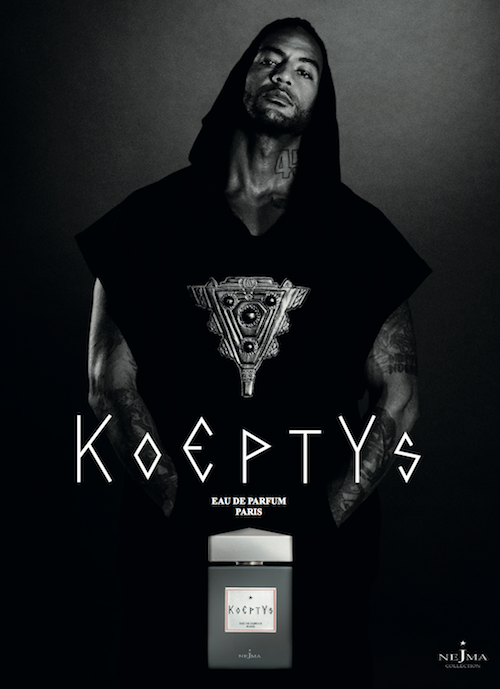 Created and developed by José Eisenberg, the EISENBERG Paris brand has a unique backstory with the Founder’s extensive experience in the world of beauty and high-tech research. A world-class expert in skincare marrying science and nature, he discovered and patented the revolutionary ‘Trio-molecular’ formula, whereby three molecules work in synergy to regenerate, energise and oxygenate the skin. Eisenberg based his 15-year research on the combined action and the anti-ageing effects of bio-cosmetic molecules enzyme, cytokine and biostimulin. ‘Enzyme’ digest and eliminate dead cells, ‘Cytokine’ is key to the communication between cells. Peptides are messengers sent by specific cells (leukocytes, immune cells), which act on the receptors of the other cells to induce many vital reactions, one of which is cell renewal and ‘Biostimulin’, from the fresh tissue of young beech shoots, it stimulates cell oxygenation, a vital source of energy, as well as the synthesis of collagen and elastin, which guarantees tone and elasticity. TheChicGeek says, “This is a gel formulation. I’m not a massive fan of gel-like products. I find I lose control with the razor when shaving and also it doesn’t give that satisfying foam as a cleanser. They also, sometimes, take more effort to wash off. 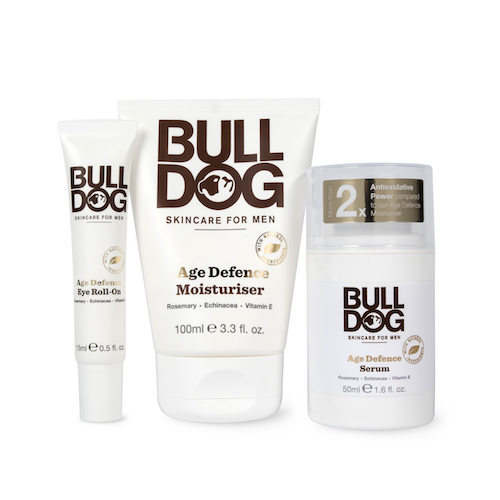 Bulldog Skincare’s new 'Age Defence' range comprises a Moisturiser, a “potent” Serum and Eye Roll-on. Each product is said to have a powerful blend of antioxidants from rosemary and echinacea to help fight free radical damage as well as vitamin E.
The Age Defence Moisturiser is said to reduce the appearance of fine lines and wrinkles after 4 weeks. *Consumer trial - 146 male participants, June 2017. It’ll also brighten the complexion and leave your skin feeling moisturised and nourished. The tube is part made from sugarcane plastic - plastic which is produced from ethanol derived from sugar cane production - to help reduce consumption of fossil fuels. With more than double the concentration of antioxidants as the Age Defence Moisturiser, the serum has been formulated to leave the skin feeling firm, smooth and nourished. Should be used underneath the moisturiser for an extra boost of hydration and the Age Defence Eye Roll-On has been formulated to help reduce the appearance of fine lines, dark circles and puffiness. TheChicGeek says, “If I was going to be picky I would say just use Bulldog’s “Protective Moisturiser” with an SPF if you want ‘anti-aging’, as the majority of our skin’s aging is from the effects of UV rays from the sun. Many men have grown up with Bulldog, and trust it, so it’s about time they did a range of “Age Defence” products for their loyal and maturing fan club. They did have an “Anti-Ageing Moisturiser” before, but not a full range. The new Age Defence Moisturiser will be replacing this, as they say they’ve done more tests to prove the efficacy on this one. It has more of a potent blend of antioxidants and different actives. These products are targeted specifically at those who would like to prevent the effects of free radical damage - which is the main cause of skin ageing. Free radical production increases under certain conditions such as UV radiation and environmental pollution; known as oxidative stress. I never really buy into this idea of "anti-aging", but if you look after your skin, from a reasonably early age, it will reward you. FYI - Lots of sleep, water and SPF help too. The moisturiser has a “brightening” element which helps to lighten and even out skin tone. If you lighten the darker blemishes, the skin looks younger and more flawless. Brands are often afraid to mention skin lightening, but it works to deceptively even out creases and wrinkles. 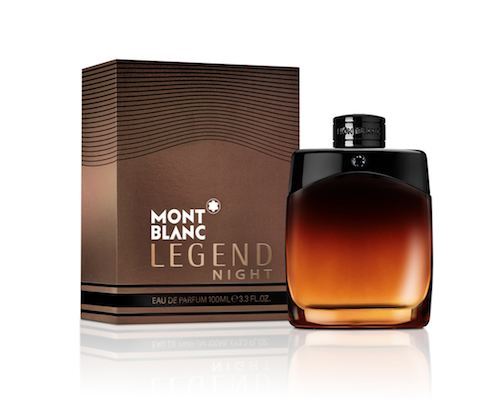 TheChicGeek says, “You’ll be pleased to know this doesn’t smell like the top deck of a double decker bus. 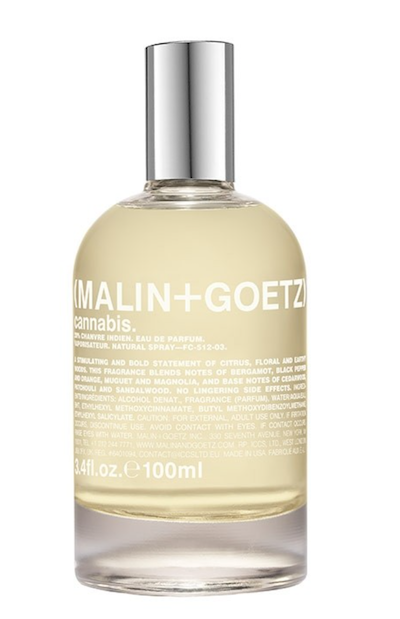 If somebody sprayed this and you had to close your eyes, you’d never guess this was called ‘Cannabis’. 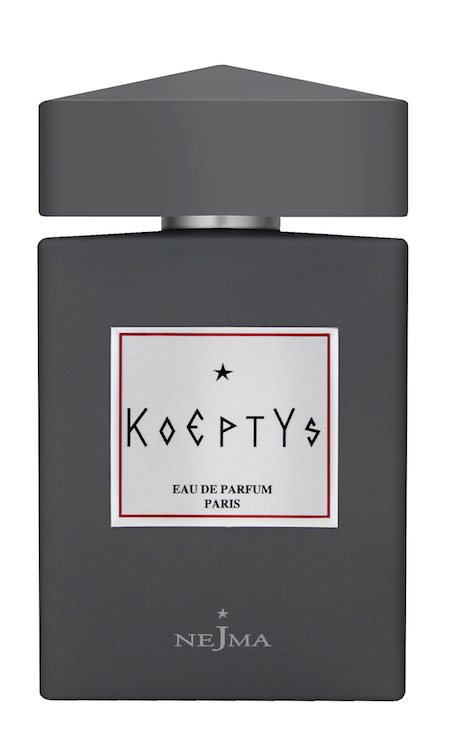 Inspired by Andrew Goetz’s time in Amsterdam, the fragrance contains bergamot, black pepper and magnolia with a base of cedarwood, patchouli and sandalwood. It’s fresh, fragrant and warm. There isn’t any smoke or that pungent odour associated with cannabis and is definitely an easy-wearer. This would make a good, everyday fragrance and I think the 420 fans will be disappointed if they smell this. Maybe they should have called it 'Amsterdam'?"